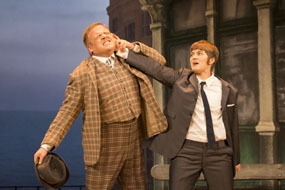 The National Theatre’s acclaimed production of One Man, Two Guvnors, directed by Nicholas Hytner, is a rip-roaring performance full of outrageous slapstick scenes, witty word play and brilliant comedic performances. The award-winning play celebrates everything that is great about British comedy. It has you laughing out loud the whole way through. Based on The Servant of Two Masters by Carlo Goldoni, an 18th century improvisation-style Italian play, it tells the story of the loveable Francis Henshall. After being fired from his skiffle band, he becomes Roscoe Crabbe’s minder. The first complication, however, is that Roscoe is in fact his twin sister Rachel posing as her dead brother. He has been killed by her boyfriend Stanley Stubbers. To protect her boyfriend, who she still loves despite him murdering her own brother, Rachel pretends to be Roscoe to secure some money so that she can escape to Australia with Stanley to evade the police. If that wasn’t complicated enough, Francis spots the chance of earning some extra money by taking a second job – as Stanley Stubbers’ minder. 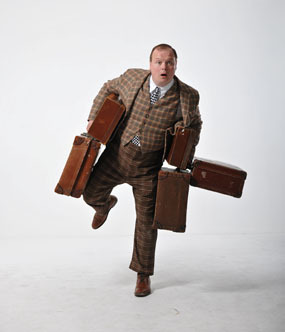 To prevent anyone discovering that he now has two guvnors he just has to keep them apart. A simple task, surely? For the easily-confused Francis, however, the juggling of his two jobs doesn’t always run as smoothly as he hopes. Finally, another intertwining plotline adds to the already absurd scenario. Before he was killed, Roscoe was about to embark on an arranged marriage of convenience with Pauline Clench for financial reasons and to hide the fact that he was gay. To successfully convince everyone that she is her brother, Rachel has to maintain the façade of intending to marry Pauline to secure money from Charlie Clench so that she can buy her passage to Australia. Phew. The second is ‘Commedia dell’arte all’improvviso’ or ‘Comedy of the craft of imrpovisation’. As a former University of Edinburgh student I am a massive fan of ‘improv’ shows. It was great to see a couple of scenes that involved members of the audience. The participants had small, simple tasks to do on stage. This allows Francis to deliver all of the humourous dialogue during these sections. He ensures the play remains on the right side of audience involvement avoiding the slightly cringey panto-style alternative. The funniest scene of the whole performance comes at the end of the first half. I can’t ever remember laughing so much whilst watching a play. Set in a restaurant, Francis has to wait on his two guvnors by keeping them completely separate in two different private dining rooms. simultaneously he attempts to steal the lion’s share of the food to eat later. The ‘help’ Francis receives from 87-year-old waiter Alfie (who is deaf as a post and is fitted with a temperamental pacemaker) isn’t enough. So he enlists a lady from the audience to help him squirrel away his portion of each course. Cue ten minutes of slapstick comedy gold. It reminds me of a cross between British comedy classics Fawlty Towers and Bottom and it has the whole audience belly laughing. The whole cast is fantastic, which is to be expected when it boasts many acclaimed actors. These inculde three ex-Eastenders stars (Shaun Williamson as Charlie Clench, Emma Barton as Dolly and Jasmyn Banks as Pauline Clench). The standout performance, though, has to be Gavin Spokes’ depiction of Francis. 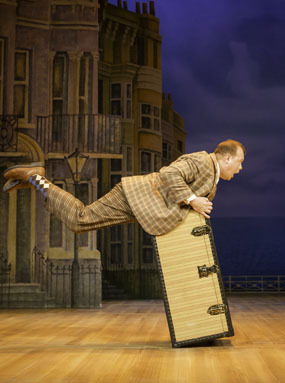 He combines skilled physical comedy sketches – he even makes lifting a suitcase comical – with perfect line delivery and comic timing. At one point someone in the audience interrupts Spokes mid-monologue. This prompts him to step out of character and have a friendly stand-up comedian-style exchange. The actor handles it exceptionally well before stepping back into character without losing the plot. He is a captivating leading man from start to finish. Other notable performances come from Alicia Davies and Edward Hancock. Davies flits between playing Rachel and (the fake) Roscoe Crabbe effortlessly. She is equally funny playing the tough guy mobster brother or Rachel who is hopelessly infatuated with Stanley. Hancock plays the incredibly over-the-top would-be-actor Alan Dangle perfectly. He comes complete with melodramatic reactions and cringe-worthy, theatrical declarations of his love for Pauline. One final unique touch that helps to carry the 1960’s theme all the way through is the use of a live skiffle band The Craze. They start the play and also play music while the sets are changed. It’s a great way to distract you from the pauses in-between scenes. If you want a genuinely entertaining evening of sparkling one-liners, outrageous slapstick and great live music then this is definitely the play for you.